More than a decade ago, the state's education system was described as "broken." What has happened since? Made up of 35 studies summarized in 19 research briefs, the project has involved more than 50 education researchers, several of whom also wrote papers as part of the original report. “Things are better, but they’re not better enough,” Stanford University education professor Linda Darling-Hammond, who now leads the Learning Policy Institute and worked on both reports, said in an interview. Based on National Assessment of Educational Progress (NAEP) results, student achievement is improving within the state and at a faster rate than the rest of the country, but overall, performance still falls below the national average, according to a summary of the findings. 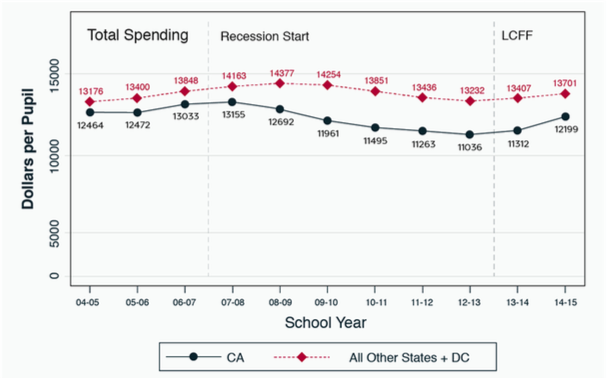 While the state’s Local Control Funding Formula (LCFF) — the result of a ballot initiative in 2012 — helped districts recover from the recession, per-pupil funding is still below the national average at just more than $12,000 per student, compared to $13,701 nationally. As with the original report, the researchers aim to put a price tag on what it would cost to provide an adequate education in the state. In addition to the $69.7 billion spent on school operations in the 2016-17 school year, the state would need to add another $22.1 billion “for all students to have had the opportunity to meet the goals set by the State Board of Education” and bring spending up to about $16,800 per student, which is still less than what states in the Northeast spend, the report says. Addressing the needs of low-income students and English learners would take roughly $3,000 to $4,000 more. Other findings show that educators, especially in high-needs schools, lack guidance on how to make the best use of curriculum materials. County offices of education aren’t providing sufficient support to districts in implementing the LCFF, and the state has a “patchwork of data systems” that make it difficult to determine the effectiveness of policies and identify schools and districts with specific needs — an issue that was also raised in the original report. “Finally, the data that do exist are unusually difficult for researchers to access," the report says. "As a result, we cannot answer basic questions on the status of California education that might help inform policymakers’ and educators’ decisions, such as evaluating the effects of programs or systems such as teacher preparation." Gov. Jerry Brown is known for being skeptical of data and concerned that it is too often misused in education. He halted funding for further development of the California Longitudinal Pupil Achievement Data System and rejected federal funding to create a teacher database as well. The difficulties that schools serving low-income students have in filling teaching positions with well-prepared educators demonstrate the inequities across the state, according to the summary. English-learners, who make up more than a third of the state’s students, also lack “equitable access to grade-level core content instruction,” which leads to lower graduation rates and less likelihood of pursuing postsecondary education. Black, Latino and dual-language learners are also less likely to attend preschool in the state, in which early-childhood education is an “underfunded, complex, fragmented system that is inefficient for providers and families.” In addition, schools and districts that try to create stronger connections with early-childhood programs have to negotiate their way through myriad funding streams, teacher preparation programs and accountability systems. Rather than including a long list of recommendations, the report is intended to guide state policymakers and the future governor’s administration by emphasizing the current condition of education in the state and highlighting “what’s been working, what are the facts on the ground,” said Susanna Loeb, formerly of Stanford University and now the director of the Annenberg Institute at Brown University in Providence, Rhode Island. Loeb led the research team for both Getting Down to Facts reports. The report, she said in an interview, identifies “structures that are good to build on” even if there are still areas to improve. Darling-Hammond added that addressing funding and teacher shortages are likely places for policymakers to begin. And some of the papers provide suggestions on how specific steps could lead to more gains in student performance. In his paper, for example, Dan Goldhaber of the American Institutes for Research and the University of Washington, writes that districts with higher salaries and that are in closer proximity to teacher education programs have fewer vacancies. This suggests that increasing beginning wages and locating teacher education programs near districts that serve low-income and lower-performing students would be a way to create more equity in the distribution of fully credentialed and experienced teachers. In another paper on students’ health and mental health, Randall Reback of Barnard College, Columbia University, notes that it would only take another $100 per student each year to expand such services in school. The state currently ranks 39th for school nurses per student and 50th for guidance counselors, the report says. Commissioned by former Gov. Arnold Schwarzenegger’s Advisory Committee on Education Excellence, along with Democratic leaders, the first Getting Down to Facts report came a few years after the decline of California’s education system was the subject of a documentary titled “From First to Worst.” The first report came to a more dismal conclusion, calling the state’s public schools “broken” and characterizing the state’s outdated, complex system of categorical grants as dysfunctional. The research was funded by the Bill and Melinda Gates, William and Flora Hewlett, James Irvine, and Stuart foundations. This time around, the Gates and Stuart foundations have been joined by the Evelyn and Walter Haas, Jr. Fund, and the Dirk and Charlene Kabcenell, Heising-Simons, S.D. Bechtel, Jr., and Silver Giving foundations. The first report also followed a 2004 settlement in the case of Williams v. California, which addressed poor conditions at school facilities and a lack of teaching materials. The settlement provided up to $800 million for repairs and ongoing maintenance. The recession created further misfortune for districts, with many laying off teachers and eliminating programs. Then Brown took office in 2011, he began cutting spending to reduce a more than $27 billion budget deficit, and voters passed the Proposition 30 ballot measure. When the next governor — either Democratic frontrunner Gavin Newsom or Republican businessman John Cox ­— takes office, there will be a more than $6 billion budget surplus. While the state lags in some areas, California is still leading in others and can provide lessons for other states, both Loeb and Darling-Hammond said. Under Brown, the state was one of the first to cut back on the number of required standardized tests and to begin using multiple measures as part of its accountability system, Darling-Hammond said. It has also reduced suspensions and increased graduation rates. And while the state's performance on the NAEP still trails the rest of the country, the state's 8th graders are inching toward the national average. Darling-Hammond also points to performance assessments for teachers and school leaders, as well as leadership standards, as policies that are helping to raise the quality of educators in the classroom and those leading schools. She also described the LCFF as a progressive finance system, particularly the supplemental and "concentration" grants available to districts serving at-risk students. And Loeb said the state could potentially provide guidance to other states on how to successfully decentralize. Because California, Loeb added, educates more students than any other state and has more diversity — not just in the student population, but also in the sizes and characteristics of school districts — the state can provide lessons on what works and doesn't work in addressing the needs of students with the greatest needs. "We need to have a great education system," she said.